DSP-Quattro 5 is the complete solution for Audio Editing, AudioCD Mastering and Plug-in Hosting for the MacOS X.
DSP-Quattro is an extremely powerful Audio Editor/AudioCD Mastering Application with extended real-time and off-line support of AU/VST plug-ins for MacOS X. It is a highly innovative product that utilizes the latest technological advances of computer-based audio editing. It benefits from more than 15 years of development and professional use in the audio production community. DSP-Quattro offers incredible possibilities. 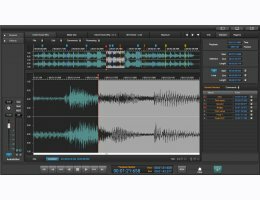 It is the complete tool for the most advanced graphical sample-based waveform editing. It comes with several professional built-in algorithms, like its state-of-art Linear Phase Sample Rate Converter, its outstanding Declicker for Audio Restoration, its High Quality digital effects, among which reverbs, modulated digital delays, analog filter simulators and parametric or graphic EQs, and much more. Moreover, DSP-Quattro expands it's capabilities exponentially as a host for third party Instrument and Effect AudioUnit and VST plug-ins. DSP-Quattro is designed for the most discriminating professional users. However, because of its simple and intuitive interface, DSP-Quattro is also an ideal product for novices in the field seeking to discover the world of digital audio. It allows for professional results, it is simple to use, and with plug-in hosting capabilities, offers seemingly endless possibilities. 64 Bits Audio and Graphic Engines. Compiled using the last MacOS X libraries, ready for next MacOS X versions. A self-contained Project keeps safely all used audio files ready for future edits. Both sandboxed and not sandboxed application versions are available. 64 bits Audio Unit effect and instruments plug-ins fully supported. Extended audio file formats support, including long audio files. Compressed audio files import without requesting any user action. Internal mp3 encoding engine, no need to install any external library. iTunes Plus AAC export option from both the Audio Editor and AudioCD Layout. New Time Stretching and Frequency Shifter phase-locked algorithms. It is possible to synchronize several Input Recorders as well as the Output Recorder. Easy and Advanced edit modes on the AudioCDLayout. Universal Binary support: DSP-Quattro runs natively on PowerPC or Intel based Macs. MacOS X 10.7 compatible, full support of MacOS X Quartz graphic libraries. State-of-art Linear Phase Sample Rate Converter (SRC) algorithm with selectable quality options, applicable also on the PlayList export, for AudioCD-ROM burning and for BatchProcessing. High precision, standard Peak+RMS Meters for monitoring of audio levels. Extended vDSP and Altivec support for extreme processing and file I/O speed. Advanced HD based High Speed polyphonic audio engine, to play any number of audio files forward and backward, at every speed, without loading them in RAM memory. Innovative Recording options, to record multiple inputs and outputs on HD in real time, also while playing Plug-in Instruments by MIDI and/or audio files. Multiple Aux output busses with separated effx chains. Support of multiple Audio File Editors, Audio Inputs, Input Recorders, virtual Instruments playing at the same time, each one having their own independent effects on insert. DSP-Quattro is easily configurable to be a Real time multi-effects unit, including Inputs to Outputs redirection. External audio devices are fully supported, to address multiple analog and digital inputs and outputs at the same time. Very unique Output Recorder module, to dump to audio file, in real time, what you are listening to. MIDI SAMPLE DUMP STANDARD (SDS) support. High quality built-in digital effects, applicable both as real time effects on audio insert, and as an off-line editing algorithm. Immediate Cut, Copy, Paste, no matter how long the audio file is. Infinite levels of Undo/Redo, with complete Undo/Redo history table, to immediately jump back to any moment of the editing session. AIFF, SDII and .WAV mono/stereo audio files with direct load/save support: 8, 16, 24, 32 and 32-floats word lengths (SDII does not support 32-bit float format). Import/Export of most audio file formats, including mp3 (export by mp3 supported if LAME framework is installed), MPEG-4, mp2, ac3, aifc, 3gp, mpa, mp4, caf, 3g2, m4a, AAC, audio tracks from QuickTime movies and Audio CDROMs and more. AUDIO RESTORATION TOOLS: built-in De-clicker, Pencil Tool and a very unique Gainer Tool to remove clicks and noises or lower unwanted transients. Cut&Paste graphic editor with user-configurable cross-fade curves. Dozens and dozens of editing functions, most of which have a real time preview control for the best parameters setting. HQ TimeStretching and Frequency Shifting Algoritms by a very special Spectral Re-synthesizer. Selectable Auto-Blend option doing Cut&Paste to smooth the waveform at insertion points. RAW data file Import/Export (8, 16, 24, 32 and 32-float bit depth), also very useful to reconstruct corrupted audio files. Drag&Drop features to export (even separated channels) and to copy&paste audio waveforms between audio file editors or even over the same audio file editor window. Plays audio files at pitches ranging from 0 to x2, including a speed ribbon controller interface. Audio scrub mode with audio monitoring. Reverse playback supported as well. Zooms and visual tools, the state of art in graphic visual waveform interface for audio editing. Left or Right independent channel editing of stereo files. Generic, Loop and Regions Markers support, with sheet window interface for their management. Extended export functions, like MarkerList or Regions to separated files, StereoToL&R separated files, and much more. Advanced floating window interface for Loop programming. X-Fade Looping algorithm fully programmable with real time preview. DSP-Quattro supports any sample rate from 8 kHz up to any value including 192 kHz. Its internal audio engine is always synchronized to the sample rate of the hardware output audio device. AU (Audio Unit) and VST 2.4 Instruments and Effects plug-in support, including plug-in having COCOA GUI. User-configurable Effx Slot management, without any limitation on the number of effects to load on insert on each module or on the global master effx send. Very easy to configure to play multiple - also at the same time - virtual plug-in Instruments by MIDI, very useful also during live performances. Master BPM tempo to synchronize virtual instruments and effect plug-ins. External I/O audio device send/return built-in as plug-in module, to address external hardware as "plug-in". Fully programmable PlayList with real time and non-destructive internal and/or plug-in effects and graphical crossfades between tracks. Each Audio region may have its own real time internal and/or plug-in effect chain. Normalize commands to normalize one audio region only, all audio regions one by one, or the whole AudioCD Layout. Built-in audio CDROM burning capability that conforms to the Redbook standards. CD-Texts, EAN/UPC, ISRC and PQ sub-codes support. Support of DDP files standard (including md5 checksum) and Roxio Toast/Jam SDII format to import/export of audioCD image files. Selectable built-in dithering algorithm with advanced noise shaper. Batch Processor, for automated file format conversion, plug-ins and additional common and ultra-fast processing. DSP-Quattro v5 needs MacOS X 10.11 (El Captain) or newer to run. Of course, it is fully compatible also with MacOS X 10.12 (Sierra) and MacOS X 10.13 (High Sierra). It needs 512 MBytes of free RAM to run and 50 Mbytes of free HD space to be installed. It runs on any Mac compatible with MacOS X 10.11. DSP-Quattro uses as much as possible all the hardware resources of your mac, as multicore CPUs and SSD HDs. DSP-Quattro hosts AU (Audio Unit) and VST 2.4 Effect and Instrument plug-ins. Hardware audio interfaces are supported if compatible with CoreAudio, a built-in component of MacOS X. CoreAudio is also used to control any Macintosh built-in audio interface. Please download the DEMO version of DSP-Quattro 5 and take the time to fully evaluate it prior to purchasing.